Uh, ACTUALLY, "Frankenstein" was the name of the cop's CHIEF. Once-familiar things hauled from their graves and put through their paces in a weekly police procedural appears to be all the rage this season, as Fox has picked up the Frankenstein cop drama The Frankenstein Code, while CBS has ordered its small-screen rehashes of Rush Hour and Limitless. The latter two join CBS’ also-picked-up spinoff Criminal Minds: Beyond Borders, a bride of the Criminal Minds flagship that was cobbled together using pieces of the franchise and whatever other procedurals happened to be lying around, and will be presented, hissing in protest, to be wedded to Criminal Minds in CBS drama eternity. As previously reported, Fox’s The Frankenstein Code differs from the many other Frankenstein projects that have been developed of late—all claiming to be different from each other—in that this Frankenstein involves a cop. Specifically a “morally corrupt” cop played by Rob Kazinsky, who’s brought back from the dead and given a second chance to get things right, this time as a living affront to God. FrankenCop will be “torn between old temptations and a new sense of purpose”—though hopefully not torn too strenuously, because he’s a corpse. 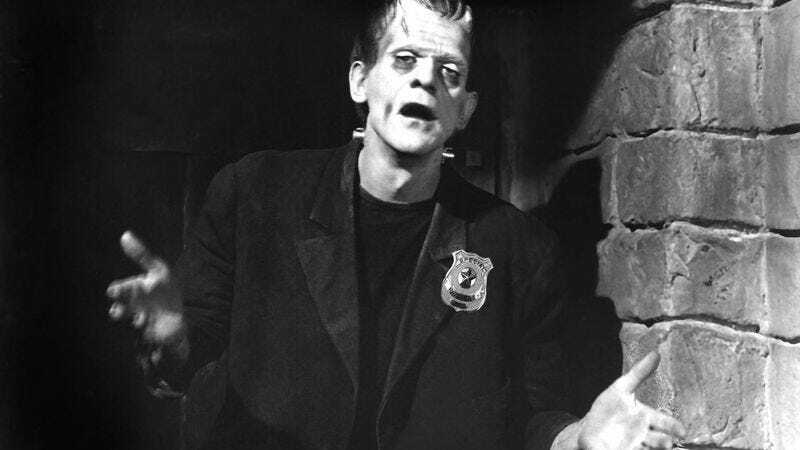 FrankenCop will soon learn that every monster’s gotta have a code. A Frankenstein Code. Limitless is, of course, based on the Bradley Cooper movie about a man who’s given infinite brain power by an experimental drug, which he then applies to the extremely limiting confines of solving crimes for the FBI. His mind can calculate strings of Frankenstein Code at unheard-of speeds. The CBS spinoff Criminal Minds: Beyond Borders will find Gary Sinise leading up a team of FBI agents helping American citizens who find themselves in trouble abroad, in distant, lawless lands that have never even heard of a Frankenstein Code. More’s the pity. On the comedy front, CBS has also picked up Life In Pieces, an ensemble sitcom starring Dianne Wiest, James Brolin, Colin Hanks, and Betsy Brandt as pieces of a large, multigenerational family that we assume will all be stitched together to form one giant creature, according to the Frankenstein Code. There’s also Angel From Hell, with Jane Lynch suddenly swooping Maggie Lawson’s life and claiming to be her guardian angel—a prospect Lawson finds dubious, as people don’t just come back from the afterlife, unless they’re Frankensteins. We have a strict code for that. Finally, CBS has nabbed a medical drama starring Marcia Gay Harden, giving its lineup the final missing piece in this grim patchwork of recycled material that will come shambling towards primetime next season. It’s called Code Black—which frankly, sounds ridiculous. What kind of code is that, even.